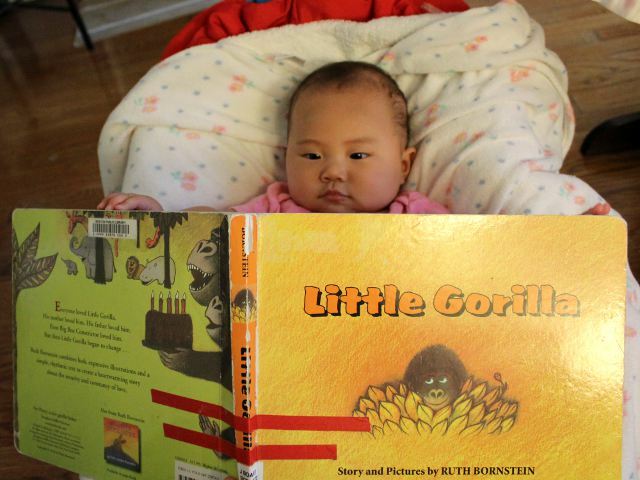 The full hardcover version of Little Gorilla by Ruth Bornstein is a huge book that stands out with a cute gorilla peeking out from behind bananas on an orange and yellow cover. Since Arya seemed to like the last full-sized hardcover book I read to her, I thought she might enjoy a big book about gorillas as well. Little Gorilla was a fun book and even though she seemed distracted Arya liked looking at all the pictures. The plot centers around the little gorilla and how much everyone loves him. On page after page little gorilla meets more animals in the jungle and all of them love him in a different way. The page with the family of gorillas loving the little gorilla was particularly cute, but every page shows a different animal interacting with the little gorilla in a different way. The end of the book shows the little gorilla all grown up and still getting love from the animals in the jungle. Large drawings fill the pages with readable, but comparatively small, text appearing on the bottom. Animals appear enormous in the hardcover version with larger animals like the giraffe and elephant unable to fit on the page. Bornstein utilizes bright colors for many animals which provide a nice contrast against the soft pastel backgrounds. Older children will appreciate the touching story and understand the theme of love. Young babies will like the huge animals and color scheme. Arya also liked touching the big pages of the hardcover book. Little Gorilla costs (including shipping) $6.99 new and $3.99 used from Amazon.